The WHL has released its roster for the 2018 CIBC Canada/Russia series, which starts off Nov. 5 in Kamloops. Vancouver Canucks prospect, Jett Woo will be one of the WHL’s defencemen for the tournament. 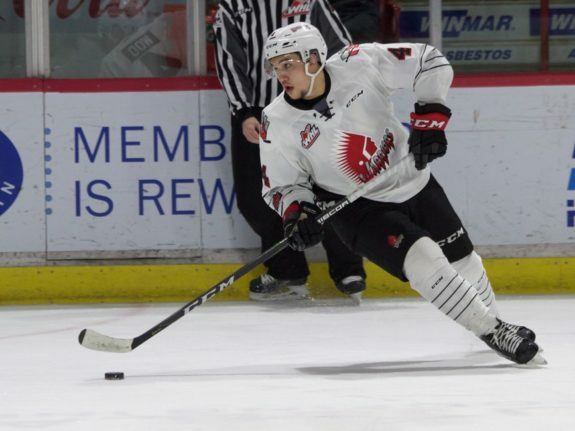 Woo was drafted 37th overall by the Canucks in the 2018 NHL Entry Draft and is currently skating for the Moose Jaw Warriors. Woo is currently in his fourth campaign with the Warriors and has become an integral part of their defensive core. He’s not exactly impressive, in terms of offence, but he does all the little things right. He’s coming off of a personal-best 25 points in 44 games last season with the Warriors, but a plus-29 rating. Woo is a terrific skater with an unteachable level of hockey-sense — he’s rarely caught out of position, and if that time ever comes, he’s got the jets to get back to where he should be. The 18-year-old grew up in Winnipeg but wasn’t named after the Jets. Instead, he was named after actor Jet Li, who’s known for quite violent martial arts films. Although he doesn’t do any high-flying moves, Woo, like Li, is known for bringing physicality and a lot of it. He’s not afraid to step up and play the body with his great skating and his sturdy 205-pound frame. Physicality doesn’t come without consequence though — he was plagued with multiple injuries last season (abdominal and shoulder) and laced up for only 44 games. Warriors coach Tim Hunter loves having Woo at his disposal. Having a d-man that plays a style of hockey that is, for the most part, gone from the game of hockey, is nothing short of a very valuable weapon. “He has that old-school rock ’em, sock ’em where he’s not afraid to lean into somebody. You don’t see a lot of big hits anymore and he’s willing to do that. And he’s not intimidated if guys want to make him accountable. We had a game in Spokane where he ran over a guy and their supposed tough guy came out and gave him a bit of an ear lashing. And the next shift Jett ran him over, too,” Hunter told Sportsnet. Physical d-men are in high demand in the NHL, especially in the Western Conference, and even more so on his draft team, the Canucks. Woo is of Chinese descent, and it’s something that he proudly carries with him on and off the ice. Much to Woo’s delight, Metro Vancouver is home to over 400,000 residents of Chinese origin. Woo is the second-highest NHL draft pick of Chinese descent. “To have my heritage with me in this process is something that’s really cool to me. And to grow up so involved in my heritage, my family is something really special,” Woo told Sportsnet. With the exception of Erik Gudbranson, the Canucks’ blue line has been lacking physically (among other things) for quite some time. Solid defensive prospects have also been relatively hard to come by, so for those reasons, the Canucks are very excited about the selection of Woo. Talks of Woo potentially being the ideal partner for fellow prospect Quinn Hughes have already started swirling. 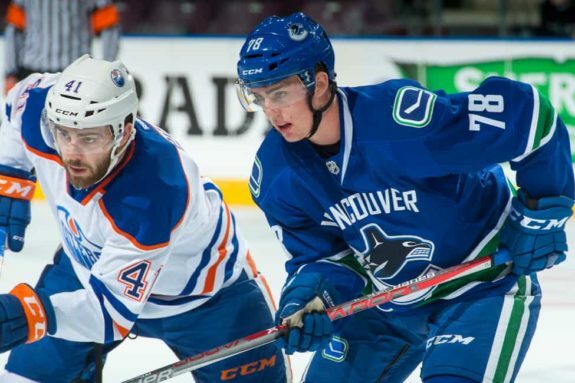 At just 18 years of age, the young man is still likely three or four years away from seeing some considerable professional action, whether that be with the boys in blue and green or with their AHL affiliate, the Utica Comets. So, unfortunately, Canucks fans might have to tolerate a relatively soft defensive core for a few more seasons. Canucks personnel are very excited about the project. With that being said, the 2018 CIBC Canada/Russia Series will be a good time to see what Woo is capable of with a slightly higher-caliber of hockey than a standard WHL game — it’s essentially a competitive WHL All-Star game with an international element thrown into the mix. Woo will be following in the large footsteps of fellow Canucks prospect, Kole Lind, who dominated the series for the WHL last year. He won’t be able to put up the points Lind did, but playing a sound defensive game and putting a few Russians on their butts could gain him a similar amount of recognition. Woo does have some international experience — he’s performed strongly for Canada at the 2016-17 under-18 World Championships, the 2017-18 Hlinka Gretzky Cup and also Hockey Canada’s Summer Showcase Tournament last Summer, where he already started making his case for the coming World Junior Championships. The WHL has put forward a strong defensive roster, headlined by Bowen Byram, the Vancouver Giants defender who is the top-ranked d-man for the coming 2019 NHL Entry Draft. Byram has 12 points in 14 games so far with the Giants and Woo could potentially be paired up with the rising star to balance out his offensive flair. However, my money is on Woo being paired with his Warriors teammate and fellow Manitoba product, Josh Brook, who is a Montreal Canadiens prospect and brings more of an offensive game to the table. After the WHL plays the Russians in Kamloops, they’ll be coming to Vancouver the next day to play in the Giants’ barn, the Langley Events Centre in front of, likely, a lot of Canucks fans. What do you think about Jett Woo? 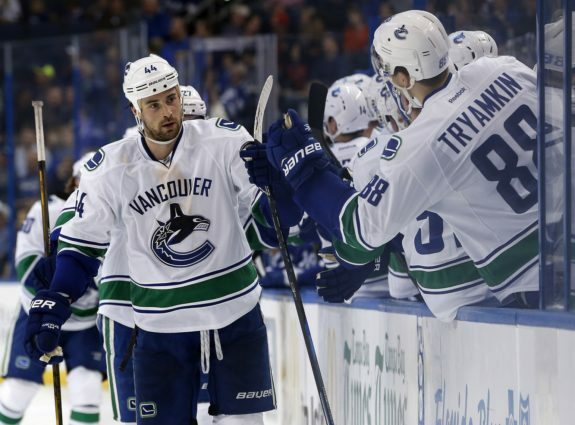 Is he the physical defender the Canucks need? Let us know your thoughts in the comments below.